In the upcoming month, preparations are being finalized with our FREE 2-day Kicking Bear Camp -West Salem 2018 which is taking place on August 3rd and 4th. Lots of fun games to participate in, along with prizes, and a free t-shirt and hat for all youth participants. We hope to see you all there!! See flier at the end of the newsletter for more information and how to register. This month, we feature a story from Jennifer and Josh Ferries. A couple who took 12-year-old Grace Clark turkey hunting for the first time. It is an inspirational story of how two people can change the life of a child forever. Jennifer Ferries and her husband Josh were in the process of remodeling their house when Jennifer got a call from Ray Howell asking if her and Josh could take a child by the name of Grace Clark turkey hunting during the youth hunt. Grace is 12 years old and has never been hunting before. She also grew up without a significant father figure in her life, so she was never able to experience shooting a gun or stepping into the outdoors. Even though the Ferries’ were busy with the remodel, Josh and Jennifer made the time to step into Grace’s life and bring her hunting for the first time. On Saturday April 14th, the day before Josh and Jennifer were to take Grace hunting, Grace and her family made their way to the Ferries’ house for a homecooked meal. That night, Josh took Grace out to learn how to shoot a gun for the first time. “She was a very accurate shot for never shooting a gun before,” Jennifer recalled. Grace spent the night at the Ferries’ house and woke up early the next morning to walk out to the blind to hopefully see and shoot her very first turkey. Within 30 minutes, three big toms walked towards their blind gobbling. Josh helped Grace to get set with her single barrel shotgun and aim her sight onto the bird. After Grace released the safety, pulled the trigger and her shot went off, she fell backwards onto the ground as the gun was so powerful compared to her small stature. “Did I really just do that?” was Grace’s first thought when she stood up. When Grace realized that she had in fact shot her first turkey, she did not know how to react right away. She instantly called her mom to express her excitement for what she accomplished that morning and tell her all about her story of hunting. Grace’s mom only lets her children eat meat that she knows where it is coming from, so being able to contribute by shooting a turkey was a big deal for Grace. As soon as the turkey was cut and cleaned, Becky made several meals for the family in the next few days including turkey fajitas and turkey chili. For Grace, learning about turkey hunting, being able to shoot a turkey, and bringing it home to her family to eat made a big impact on her life. Not only did she get to provide for her family, but she made some lifelong connections with Josh and Jennifer. Josh stepped into Grace’s life as a type of father figure while him and Jennifer took Grace hunting. They were able to show her that there are good male and female role models in the world that love and believe in God and are willing to go out of their way to be there for her and support her. Everyone has the same amount of time each day, but not everyone has the same priorities with their time. 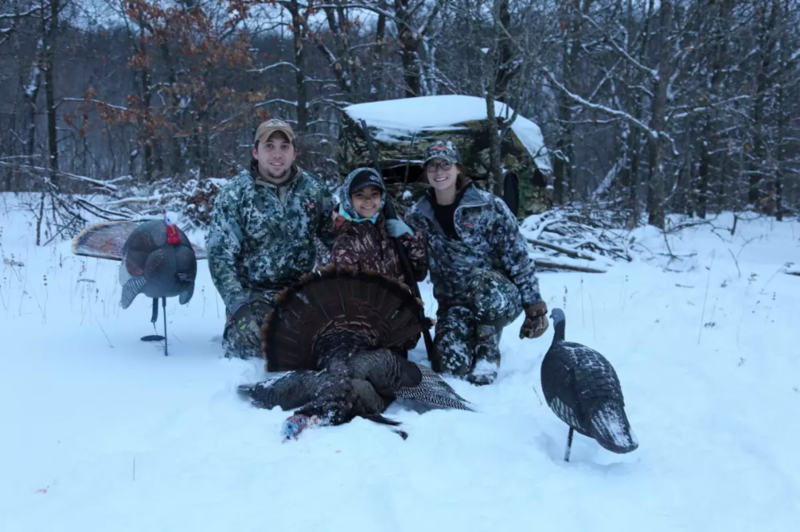 Josh and Jennifer made Grace a priority and significantly changed her life forever by teaching her about turkey hunting, showing her how to shoot a gun, and harvesting her first turkey. Grace will have those memories forever, as will Josh and Jennifer. They all continue to keep in contact and are even planning on going to her upcoming soccer games to show their support to Grace.